As some of you know our friend Marcus Brookes was involved in a terrible accident November 4, when he and Chris had taken his car down the highway for a test drive. Something didn’t feel right with the car so Marcus pulled over on the shoulder to check it out. As they got out of the car a distracted driver hit Marcus pinning him between the cars. We are planning an evening to help Marcus and family with bills and medical expenses. 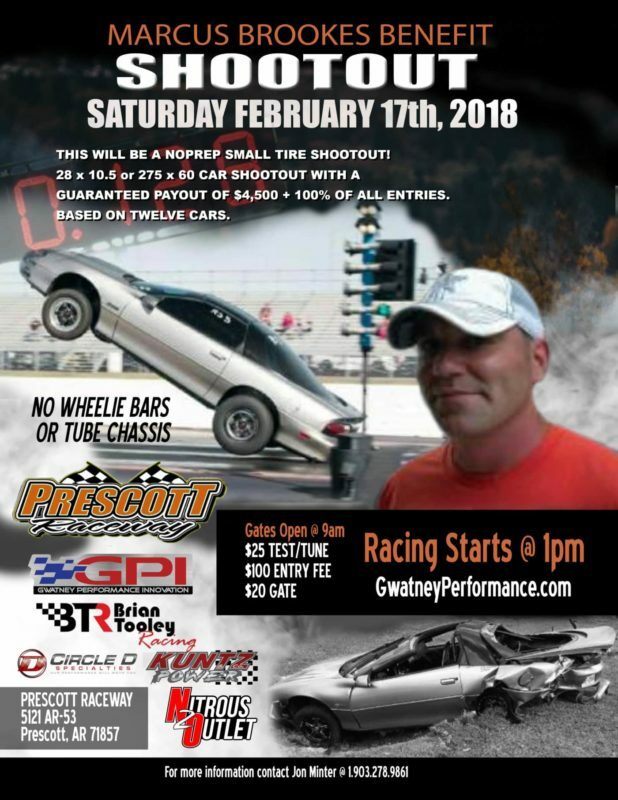 This will be a NOPREP N/T small tire 28×10.5 or 275×60 car shootout with a guaranteed payout of $4500+100% all entires based on 12 cars. I am going to keep praying & now specifically for bone growth!!! Prayers, sometimes healing can go so slow. You need a redneck doctor, he'll throw a few zip ties in there and you'll be back to work in no time! Prayers brother. Prayers for safe travels and a great report!! Thank you all for the prayer! Prayers for traveling grace and a good report from the doctor! Updates From The Brookes shared a link. Hi everyone!! I have to share this!! Our youngest, Emily Simmons, made this video as a submission for a scholarship to college. I can't watch it without knots in my stomach, chills all over, & tears in my eyes! We hope you all enjoy it! Please let her know what you think either on YouTube or here! Amazing! In a blink of an eye life can change. Wonderful job Emily! Great job, Emily! I thank all of you for sharing this journey with the rest of us, for getting the message out about the dangers of distracted driving, and for praising God as you’re accepting your new normal. May God continue to pour His blessings upon you all! Love and hugs! Powerful! Great job and effects. Wow!! This gave me chills! Great job, Emily! Chills! Chills from my head to my toes. Video is very good and it will certainly be a reminder not to look down for older than teen drivers (like me! ), also! Updates From The Brookes shared a post. Also.....his car is in Port Allen, Louisiana right now. Mr. Brian "Madman" Jeffery is working his magic on it installing the cage and other things that have to get done before he can start putting the engine and other mechanical parts together. As soon as he gets it back they are getting busy! He is expecting to be racing this year!! 😲 How exciting!! I can't wait to see him behind the wheel again! So, as you can see we have a lot of work ahead of us. All this on top of working full time and enjoying the time we have free to get out and take day trips or just hang out with friends and family. It's time to live!! We spent last year healing his body as much as we could. Now we are no where close to being at our new normal. We still have a long way to go. But...we have to work more on our hearts and souls. We have to find a way to clear our heads and appreciate all the time we can that we are given to spend with each other. Yes, we have to work, but we have limited time to enjoy this life. The updates are great to hear! I’m glad he is building another car. If you guys ever want to come hang out and watch a filming don’t hesitate to text me. Love the update!! Lots of respect for you!! Praying 2019 will be your best year yet!! Marcus had a follow up appointment today with orthopedics. We got there at 10am for a 10:30am appointment. Sat in the waiting area for about 30 minutes until they called him back to check him in. They checked his blood pressure, which was good, and went over his meds then sent him to radiology. They took X-rays of his arm and and left leg. We then went back to the waiting area for ortho to wait another 45 plus minutes. They called him back to a room. We sat there and waited long enough for us both to almost get a nap...(about 45 minutes). The nurse practitioner came in and checked him out and asked if he was having any unusual pain...and out she went....and we waited another probably 20 minutes (I may not be exact on all these times). Then the old school Italian doctor-that-does-not-want-to-have-to-deal-with-my-mom-anymore-so-he-just-does-what-she-wants 😂 came in. (Ahem Cindy Ruth Groce) Annnndddd told Marcus he is free to stand on his leg and use his arm as much as he can tolerate!! Woohoo!! It's been a month since his surgery. Him being stuck in a chair...again! Now he has to get his strength back. He seems to have lost a lot of strength in all of his extremities. We are going to get to work building this back up! As hard as he is willing to work it should not take long! More good news....he got the word to take his new car to the best chassis guy around!! Brian Madman Jeffery!! They dropped it off yesterday!! Also, he has been in contact with Brian Tooley regarding his engine! He has made some decisions and they are helping him put together the best combination for what he is wanting!! I think we are all pretty excited for this to get going!! I can't wait to see him rolling down the track again!! Also, our oldest child, Destiny Brookes, received her Business Administration Degree today!!! We are so VERY proud of her! She has worked so hard to get here!! We love you!! All great news! God bless. Great news. And congratulations Destiny. Praying for y’all daily, so glad prayers are being answered! Praise The Lord for all the progress. Continued prayers. Way to go !!! So Glad things are going well and positive for Y'all !!!! Man that is awesome news on all fronts! Congratulations all around!! Sounds great and wishing ya'll a merry Christmas!!! Continued prayers. We serve an Awesome God. Hows the stimulator working out? Updates From The Brookes shared a photo. Glad ya'll made it home safely! Praying it works! Thinking about you bro...c u soon! (Available Now!) The Brand New MAX Performance Head & Cam Package for LS3 / L99!! !